Mit steigender Menge an konventionellen Röntgen- sowie CT- und MRT-Bildern im stationären, ambulanten und wissenschaftlichen Alltag steigt unweigerlich auch die Zahl der Zufallsbefunde. Die korrekte Einordnung bzgl. 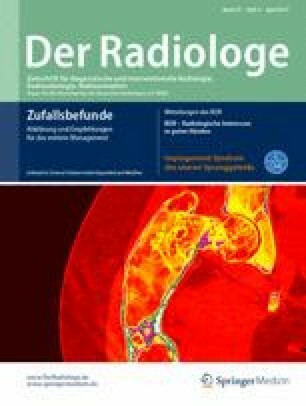 deren Relevanz, ob eine weitere Abklärung notwendig ist oder nicht, stellt eine wichtige Aufgabe des Radiologen dar. Vorstellung häufiger Zufallsbefunde des muskuloskeletalen Systems und deren klinische Einordnung. Pubmed-Literaturrecherche zu den Stichworten „incidental findings”, „population-based imaging”, „musculoskeletal imaging”, „non-ossifying fibroma”, „enchondroma”, „osteodysthrophia deformans”, „chondrosarcoma”, „fibrous dysplasia”, „simple bone cyst”, „unicameral bone cyst”, „solitary bone cyst”, „aneurysmal bone cyst”, „vertebral hemangioma”, „bone island”, „osteopoikilosis”, „Tarlov cyst”, „diffuse idiopathic skeletal hyperostosis” (DISH). Bei bis zu 40 % der Schnittbildgebungen finden sich Zufallsbefunde. Etwa 6 % der Zufallsbefunde entfallen dabei auf das Skelett. Häufige Zufallsbefunde und deren klinische Relevanz werden dargestellt. Increasing numbers of conventional X‑rays, computed tomography and magnetic resonance imaging in the inpatient, outpatient and scientific routine leads to an increasing number of incidental findings. The correct interpretation of these incidental findings with respect to the relevance and the evaluation concerning further work-up is an important task of radiologists. Description of common incidental findings in musculoskeletal imaging and their clinical classification. A PubMed literature search was performed using the following terms: incidental findings, population-based imaging, musculoskeletal imaging, non-ossifying fibroma, enchondroma, osteodystrophia deformans, chondrosarcoma, fibrous dysplasia, simple bone cyst, unicameral bone cyst, solitary bone cyst, aneurysmal bone cyst, vertebral hemangioma, bone island, osteopoikilosis, Tarlov cyst and diffuse idiopathic skeletal hyperostosis (DISH). Incidental findings are observed in up to 40% of imaging procedures. In up to 6% these incidental findings involve the skeletal system. Common incidental findings are discussed and their clinical relevance is explained. F. Wünnemann, C. Rehnitz und M.-A. Weber geben an, dass kein Interessenkonflikt besteht.